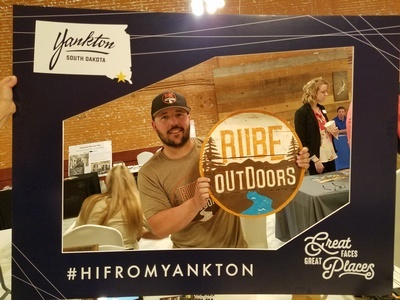 To kick off the start of the Peak Tourism Season, Visit Yankton will host an expanded version of last year's inaugural Fam Day event. 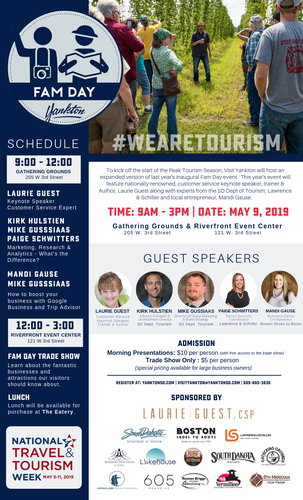 This year's event will feature nationally-renowned, customer service keynote speaker, trainer & Author, Laurie Guest along with experts from the SD Dept of Tourism, Lawrence & Schiller and local entrepreneur, Mandi Gause. 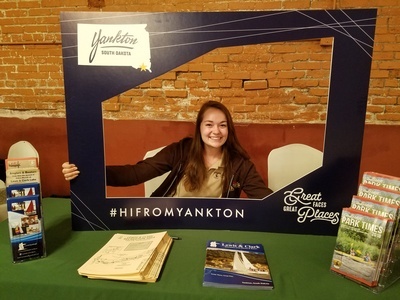 It is an opportunity for anyone who interacts with a visitor to familiarize themselves with the various attractions and businesses that might appeal to our visitors, so that you can answer the question. "What is there to do in Yankton?" Hospitality & Customer Service Training Laurie Guest (Click Here to check out Laurie's speaking style) Laurie is a certified speaking professional, a designation held by less than 12% of speakers worldwide. During a 20-year career in the health care field she became known as the ?go-to source? for customer service training in her industry. 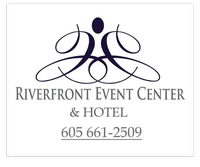 Two decades ago she formed her own professional training company dedicated to customer service and staff development. Laurie is a published author who speaks from a practical point of view and is known for her quick wit and slightly sarcastic sense of humor. She will make you laugh with a perfect blend of humor and content that matters to your career. Marketing Research & Analytics Presentation - What's the Difference? Kirk Hulstein, Industry Outreadh & Development Director for the SD Department of Tourism - Mike Gussiaas, Global Marketing 7 Brand Strategy Director for the SD Department of Tourism - Paige Schwitters, Account Executive for Lawrence & Schiller will host a presentation showcasing inexpensive but impactful ways for businesses to make informed decisions about marketing. How to Boost Your Business with Google Business & Trip Advisor: Mandi Gause, Entrepreneur and Small Business Owner of Boston Shoes to Boots & Mike Gussiaas, Global Marketing 7 Brand Strategy Director for the SD Department of Tourism will host a presentation on the benefits of maximizing the potential of your Google Business and TripAdvisor platforms. Anyone working with customers. This training is not exclusive to the tourism Industry, all businesses are encouraged to take advantage of this valuable learning opportunity. 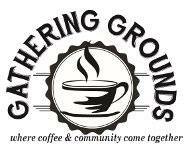 Sponsorships of $100 will receive four tickets to the event and logo inclusion on marketing materials. Register as a FAM Day Sponsor by dowloading this form and returning it to kasi@yanktonsd.com. 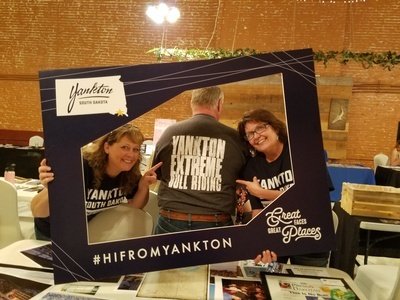 Register your tourism business, attraction or organization to host a table at the tradeshow by downloading this form and returning it to kasi@yanktonsd.com.